Dongle security let you use the program on any computer, just connect the dongle, while serial number security will let you only to use the program on one computer. We support our buyer on line free for 15 days after purchase. Manual sequin punching method: can complete and create any kinds of sequin stitches. Auto sequin punching method: performs all kinds of sequin effects to the best, and makes the sequin punching with high efficiency, plus precision and accuracy. The designs made by auto sequin punching method are extremely easy to edit, revise and good for re-use. Auto Sequin Stitches Mode: it is the thread enveloping, also called sequin stitch. Available choice of 3-stitch star, 2-stitch star, 2-stitch furling, 4-stitch furling and 3D stitch, etc. Support Dual Sequins function: excellent dual sequins punching and design, DST file output, allow the front and rear devices to feed the sequins. Produce the dual sequins design with the system, and simulate the actual design outlook, high efficiency and easy to get the work done. 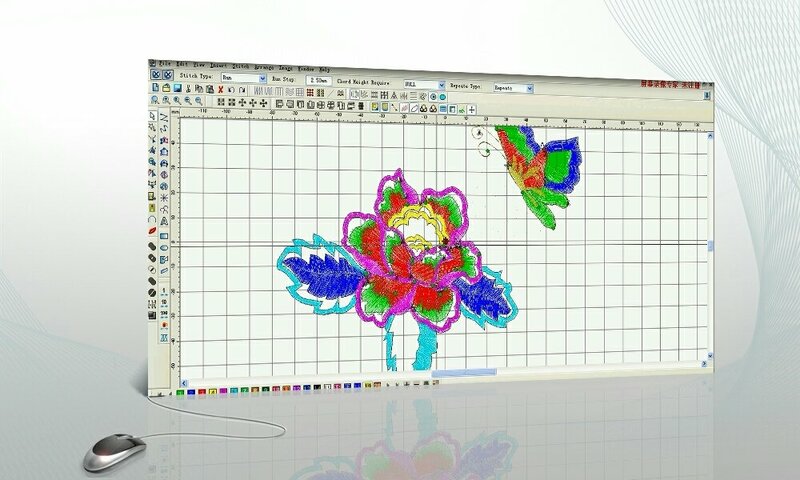 This software integrated the creation, style design, digitizing and simulation work in a whole. To make the traditional digitizing and graphic editing together with the image processing technology as a combination work. Greatly enhanced the creation, editing, touch up and design work with this software. Software with simple and easy to directly make the design. Directly communicate with Richpeace Rhinestone Embroidery Machine. Provided a total solution from the design and fabrication, it is the unique choice for any of the Rhinestone pattern designer. Richpeace Design Pro 2000 enables its user to freely create lettering, directly typing in the fonts and editing on the screen. Also allow the editing with the lettering dialog box. Able to create different lettering style and filled with various stitches effect. Richpeace Design Pro 2000 can allow users to load the standard fonts or create user’s own defined font library. Adopting the font library provided with the program, can rename the library or the letters in it, modify the letter spacing of a letter or the parameters. It can modify or shape a letter with Pick Tool or Shape Tool and save it to the library. The original letter will be replaced with the modified one if they have used the same name.